Of course, Florida remains the most important state for Donald Trump. 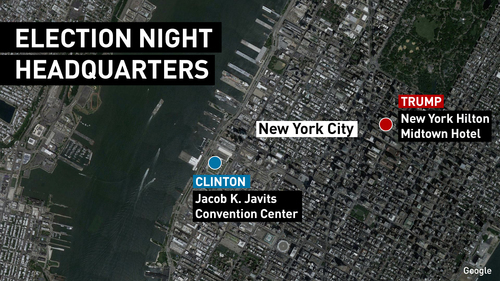 He's up narrowly there, so a map that results in a Trump presidency can start being drawn in. But the assumptions that made Florida such a decisive state for Trump included a win in Ohio, where the polls have favoured him by a slim margin. Instead he's trailing in Ohio by a big margin, though many votes have yet to be counted. If he loses Ohio, he can go a long way towards making up for it by winning Virginia. He's up in the vote count there, despite Virginia having long been considered in the Democratic camp. If he holds on in Virginia, then he can afford to lose in Ohio. But he can't afford to lose in North Carolina, where he currently trails Hillary Clinton. Still too early to know exactly where this is going, but it could head in some unexpected directions. Does Guam have it right again? The U.S. territorial island of Guam has a great track record for correctly predicting presidential outcomes. Its territorial residents have nailed it every election year since 1980. The catch? Guam residents cannot actually vote in general elections, though they are American citizens. So they hold a straw poll. In 2012, voter turnout was 67 per cent in the straw poll, which was a higher voter turnout than in the U.S. mainland, where turnout in the same year was 61.8 per cent. Florida continues to flip-flop between the two candidates. Clinton has been up. And then Trump. And then Clinton. 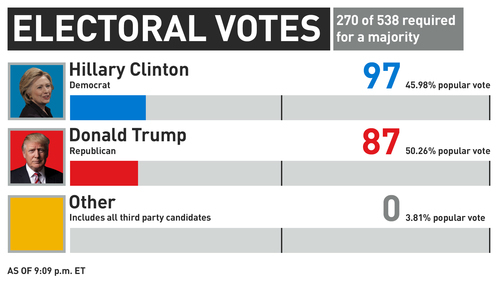 Right now, Trump has the lead there, but as the CBC's Mark Gollom points out, some counties that are favourable to Clinton are still to come. At least 70 per cent of precincts are reporting now. A breakdown of the results at the moment are below. It is still too early to call. Obama won Florida in 2008 and 2012. That was a squeaker as well. 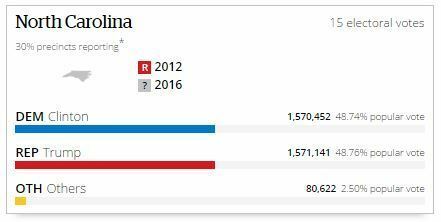 Just as a reminder that in that election year, Democrat Barack Obama won Florida by just 75,000 votes. If that sounds like a big margin, think again. That actually comes out to fewer than 13 votes per precinct. Trump, knowing that the Sunshine State was make or break for him to have a viable path to the White House, has laser-focused his campaign on Florida in recent days. Another race to watch: North Carolina. Romney and the Republicans won it in 2012, but Obama and the Democrats had it 2008. Clinton is leading there right now. About 22 per cent of precincts are reporting. She leads 49.30 per cent to Trump's 48.23 per cent and 15 electoral votes are at stake. Other has 2.46 per cent. 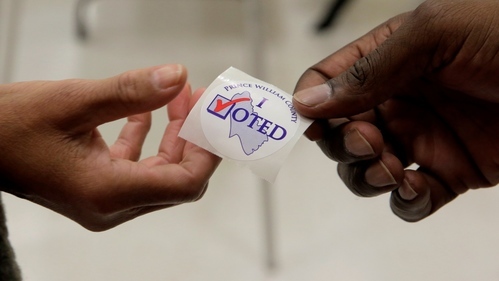 There has been some talk about voter suppression in the state ... and that has even been referenced by President Obama. 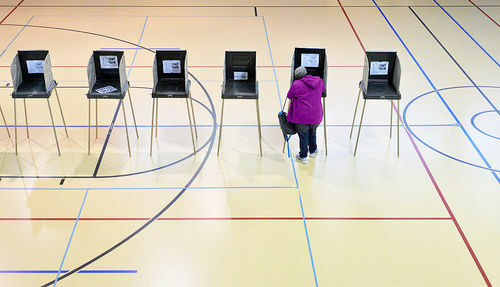 Last month, 138 people had their voter registration challenged in one county. It's 9 p.m. That means even more states have closed, including Arizona, Colorado and Wisconsin. The results in Virginia continue to be the most surprising so far. That was not a state that was considered to be on the bubble — the polls suggested Hillary Clinton had a six-point lead over Donald Trump. Instead, Trump is holding a lead over Clinton. But it could still turn blue. Most of the votes in the rural counties appear to be counted, whereas there are still a lot of votes to count in and around Alexandria, Norfolk and Richmond. Those are areas where the Democrats are strong. The problem with that? If Trump doesn't hold on to Virginia, loses North Carolina (where he is trailing) and loses Ohio (where it is tight, but there a lot of votes to count in Cleveland and Cincinnati), then that is game over for Donald Trump — even if he does win Florida. I was just talking about North Carolina as a state to watch and about how Clinton was leading there. That has changed. 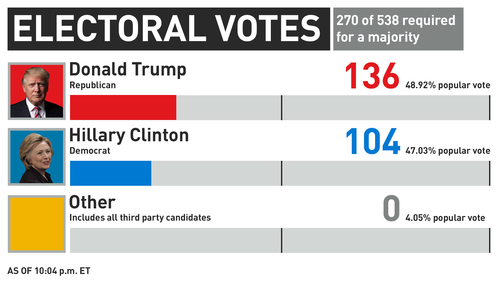 Trump is now leading, but it is a close race with at least 30 per cent of precincts reporting. 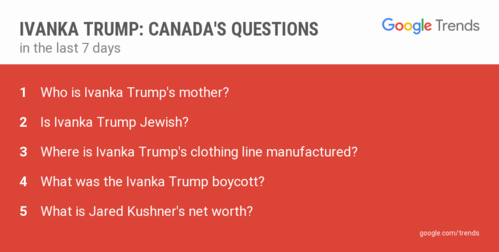 Here is what Canada wants to know about Ivanka Trump, Donald Trump's daughter, provided by Alex Hunnings from Google. Votes being counted behind this glass here in Hamilton County Cincinnati. 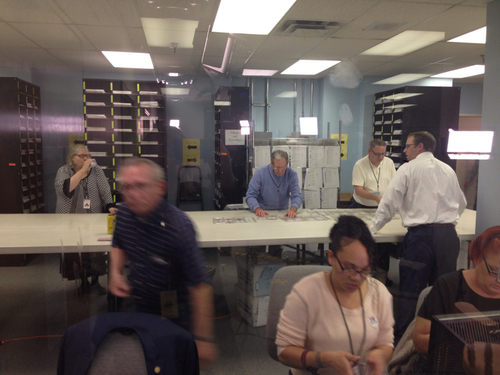 Those are microchips being organized and tallied here at the Board of Elections in Cincinnati. The chips contain all the data for every precinct in Cincinnati. They stick the microchips in machines and it tallies all the votes, CBC’s Jennifer Barr reports. U.S. Ambassador to Canada Bruce Heyman speaks to the CBC's Katie Simpson at his election night party. 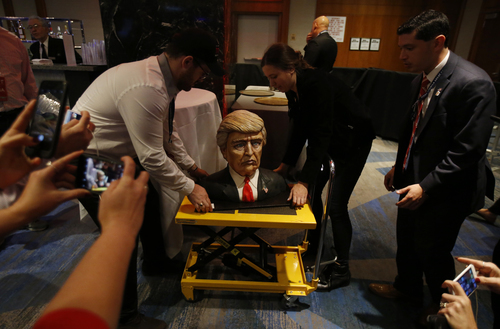 You may have seen the odd-looking Trump cake that was wheeled into Trump Tower earlier today. It has now apparently been moved to Trump's HQ not far away. That's becoming a thing online, with people Photoshopping the cake into all sorts of wacky situations and posting them online. Here's a sample. The latest count. Trump is leading with 49.87 per cent of the popular vote. 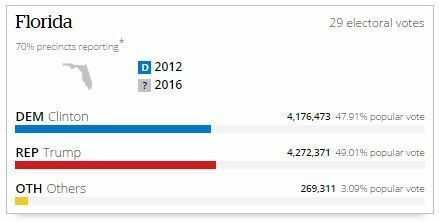 Vote-rich California is still to come. 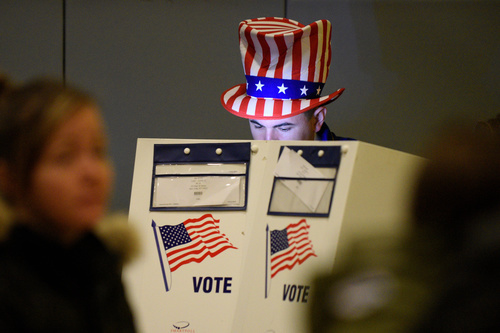 Majorities in the U.S. Senate and House of Representatives were up for grabs in Tuesday's election, and so far the Republicans have retained control of the House, leaving Democrats clinging to hopes of capturing the Senate. The outcomes will help determine how difficult passing legislation will be for either Democrat Hillary Clinton or Republican Donald Trump if they become president. CBC NewsMajorities in the U.S. Senate and House of Representatives were up for grabs in Tuesday's election, and so far the Republicans have retained control of the House, leaving Democrats clinging to hopes of capturing the Senate. The CBC's Samantha Craggs is in Erie, Pa. right now, where quite a few Canadians have been out campaigning. 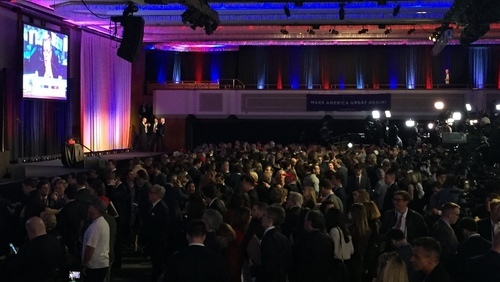 The Trump family is eagerly watching the results come in at their New York City headquarters, with Trump's vice president candidate Mike Pence at their side. Fear is a sad byproduct of this election and we’re hearing it at the University of Miami, among political science students watching election results. 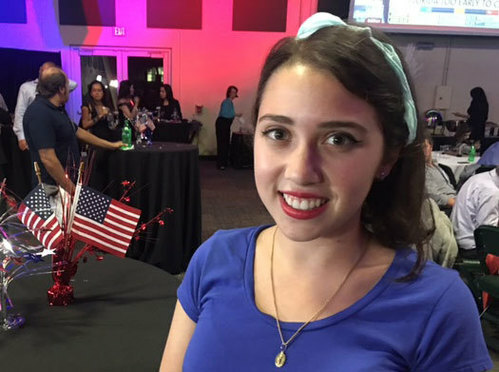 “Disappointing," says the 21-year-old poli sci student, born in Guatemala, who emigrated to Florida eight year ago. 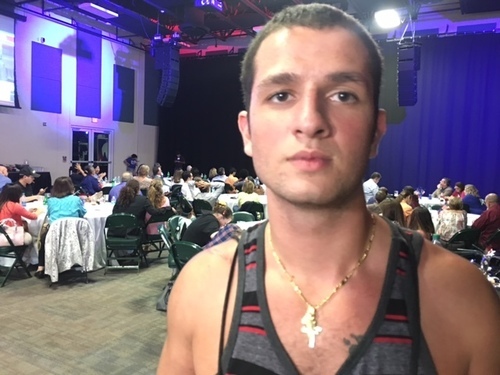 “I’m more afraid if Clinton wins," says her classmate Maury Noun; born in Brooklyn of Lebanese heritage. “Look what’s happening in the Middle East, Russia is fighting ISIS, Obama is too soft for that." Donald Trump has capitalized on characterizing Clinton a career politician, a crook, an elite. “I don't think he, (Trump) can be bought by lobbyists, he’s not going to let money corrupt his morals," says Noun. Clinton has gained some votes since I last updated you on the results. 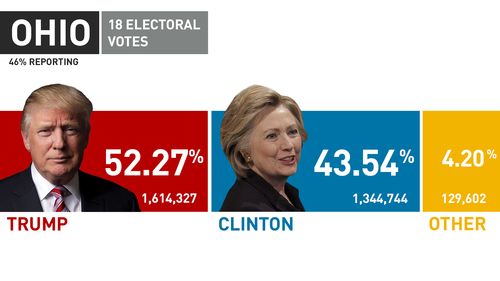 Trump continues to lead with 49.43 per cent of the popular vote. The latest total from Ohio. Obama won there in 2012. Let's pivot to results in Virginia. Clinton was expected to win there, but Trump is up at the moment. 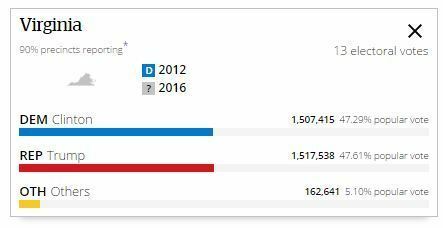 It is a pretty small margin, not what the Clinton campaign would like. The results so far are below with at least 90 per cent of the precincts reporting. Virginia has 13 electoral votes. A look at the House. Some Google insights from Google's Alex Hunnings. 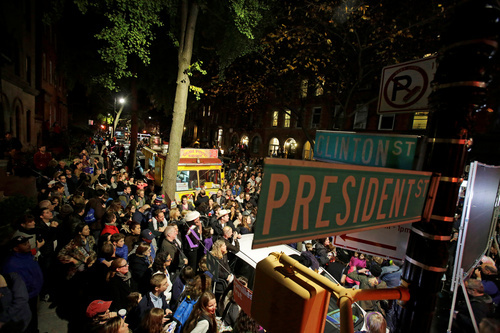 "Hillary Clinton and Donald J. Trump are both racing to earn an absolute majority of electoral votes, the magic number of 270 of the 538 presidential electors. Every four years, the United States Electoral College is the body that elects the President and Vice President of the U.S. That's because citizens of the United States do not directly elect the President; instead, they vote for "electors", who usually pledge to vote for particular candidates." 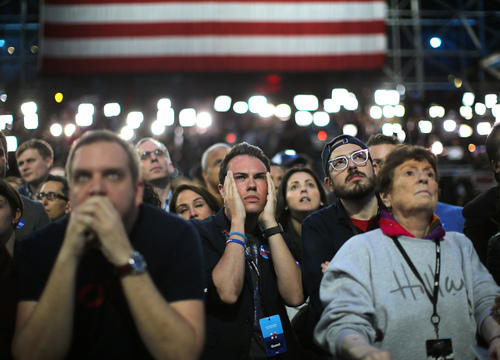 And all of a sudden it's a much more excited crowd at Trump headquarters in Manhattan. 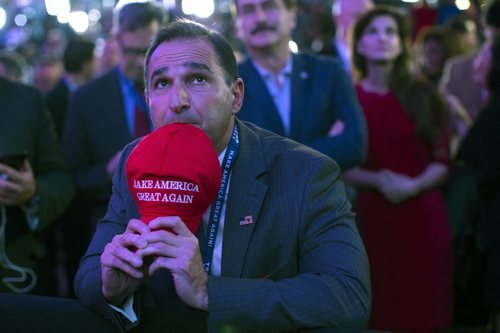 Many now wearing Make America Great Again caps. Invitees buzzing and then cheering loudly when results go up. Oh what a difference an hour or so makes. Both candidates have weighed in on Twitter this evening. Donald Trump, famed for his Twitter presence, tweeted a similar photo to the one tweeted by his daughter, Ivanka. The Trump family and friends are watching the results come in at their election night HQ in New York City. A very few thoughts from this nation's capital. The Trudeau government has been very reluctant to weigh into this election in any way and this is likely why. The Prime Minister has to be prepared to work with whomever is elected, no matter if there are things in common or not. So in the very instances where our Prime Minister might have spoken out against Trump, particularly with his misogynist language, he did not. Behind the scenes, bureaucrats, ambassadors, staffers have been working to try and draw up a map of what each administration would look like and where this government might be able to find common links. For instance, a Clinton administration would be far more friendly on climate change, Trump has said virtually nothing on this front. No matter what happens, the Liberals will have to make things work. But the anxiety in government here will be high right now because the unknown of candidate Trump would make things more worrisome for anyone trying to deal with him. What's happening with Greens and Libertarians? 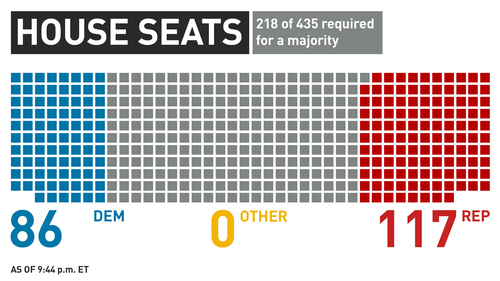 So far, the combined tally for the non-major party candidates is just about four per cent of the vote nationwide. The polls suggested the combined support of candidates like Libertarian Gary Johnson and Green Party candidate Jill Stein would be closer to nine per cent. That is a big difference — and it means a lot of points that are up for grabs for Donald Trump and Hillary Clinton. 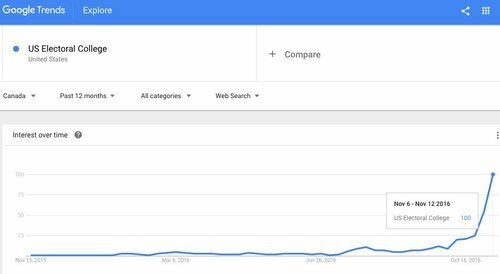 On the face of it, Trump might be the biggest beneficiary. Johnson is a former Republican governor of New Mexico. The polls had suggested Johnson's impact was a bit of a wash, but perhaps his Democrat supporters have stuck with him while his Republican voters have gone back to Trump. This could be one of the factors that will be looked at in the morning if Trump ends up on top. A few more polls have just closed, including Utah, Iowa and Nevada (each have six electoral votes). Here is the full breakdown of where polls have closed and where they are still open. Results, so far, show Trump defying most pollsters and performing better than many had predicted. If Trump wins all the states that Romney won, he will have 206 electoral votes (and that includes North Carolina) Add Florida (29), Ohio (18) and Iowa (6) that gives him 259 electoral votes. But if Trump instead wins Michigan, with 16 electoral votes, he becomes president. Without Michigan, it still becomes a bit of a scramble for Trump. The latest totals. The next big moment will likely be at 11 p.m. ET when polls in California close. That state is home to 55 electoral college votes. The U.S. dollar sank and stock markets slammed into reverse in wild Asian trade on Wednesday as every new exit poll in the U.S. presidential election showed the race to be a nail-biter, sending investors stampeding to safe-haven assets. Sovereign bonds and gold shot higher while the Mexican peso went into near free-fall as investors faced the real possibility of a shock win by Republican Donald Trump. Markets fear a Trump victory could cause such economic and global uncertainty to prevent the Federal Reserve from raising interest rates in December, as long expected. The scale of the scare was clear in the Mexican peso, where the dollar surged over 7 percent in the biggest daily move since the global financial crisis. 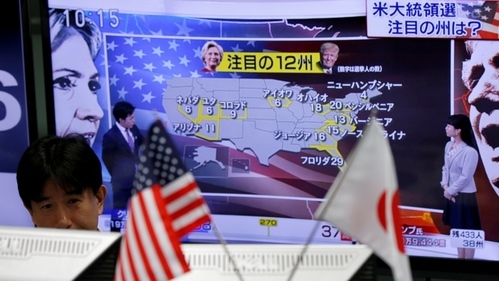 CBC NewsThe U.S. dollar sank and stock markets slammed into reverse in wild trading in Asia Wednesday as every new exit poll in the U.S. presidential election showed the race to be a nail-biter, sending investors stampeding to safe-haven assets. 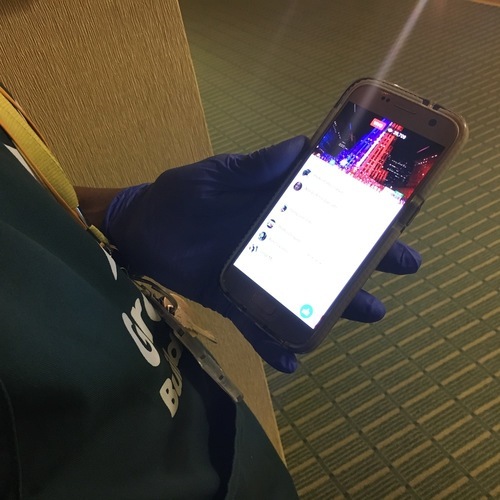 Spanish-speaking cleaning staff at the National Press Club are watching live election results on Univision off a phone in the hallway. 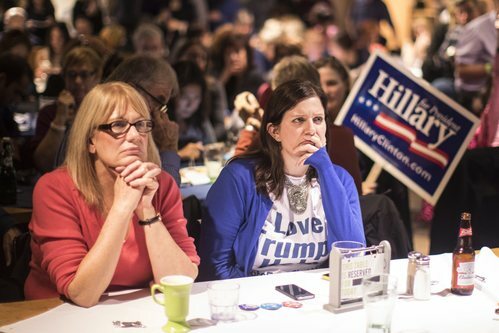 They're very nervous about projections forecasting a Trump presidency.